The patriachial society of which we are prideful is becoming an insane inhuman place for women community. The Central Board of Secondary Education (CBSE) has made a joke of itself by exposing it's unjust character to disrespect dignity of women community.In textbook of Physical education a section of book openly says the best measurement of a female body is 36-24-36. What does this signify? What message does it give to students? Simple answer is it show the way to play with dignity of women community, openly that too via route of education. 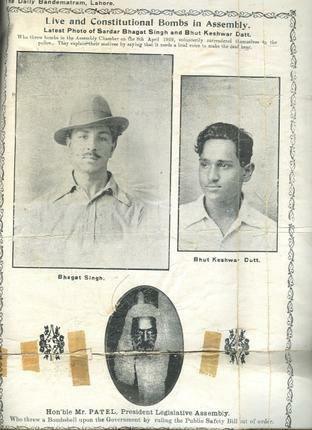 Bhagat Singh & Batukeshwar Dutt threw harmless bombs in Central Assembly Hall on 8th April 1929 against passage of two draconian bill.